Dolls that clean houses and eat chocolate, a three-thousand-year-old dragon that lives in the basement, and a school for humans and magicals… a perfect recipe for delight. 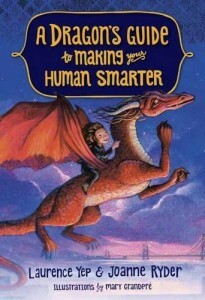 This children’s book is a sequel to the first Dragon’s Guide, and it’s at least as good, if not better. Laurence Yep is an extraordinary storyteller, and with his with now co-writing with him, his content has moved from historical fiction to pure fantasy. I adore this children’s book because it has a little bit of everything. The courage of Winnie and her ability to face all situations is at the heart of the book. Indeed, in the end, she has to rise to the occasion and does so beautifully. However, along the way, we get to meet and experience all kinds of magical characters, each with their own quirks. And we get a peek at the social dynamics in Winnie’s school, which except for the magicals, seems much like the dynamics in any grade school. For a children’s book, the pacing is fast, especially because we move back and forth between Winnie’s point of view and the Dragon’s story. One needs to be a strong and alert reader to keep on top of the activity. However, other than that, there’s no down side to this well-told and enjoyable tale. I hope there are more. The ending was especially satisfying.